Want to visit London this March? We have found you a great offer. You can fly from Houston to London for only $890 r/t. The flight is operated by Thy Turkish Airlines. The prices on economy class start from $890 r/t. It is a great deal, departing on March 18, 2014 and returning on March 30, 2014. Thus, you will have the possibility to spend 12 days in the wonderful British capital city. It will surely be an unforgettable experience. You can search for this cheap flight and book it via the box below. You can also look for other 3-4 merchants’ offers. Compare their prices with the prices of our deal! You will fly from Houston Intercontinental Airport (IAH) to London Gatwick Airport (LGW), departing on March 18, 2014 and returning on March 30, 2014. The prices on economy class start from $890 r/t. The flight is operated by Thy Turkish Airlines. The flight has one stop, at Istanbul, with a layover of 15 hours 45 minutes. You will have enough time to visit the city and have a nap. The total flight time is 79 hours 25 minutes. 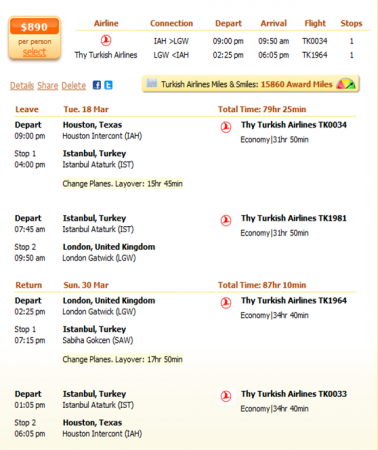 The return flight also has one stop, at Istanbul, with a layover of 17 hours 50 minutes. Thus, the total flight time is 87 hours 10 minutes. You can check the details in the screenshot below. 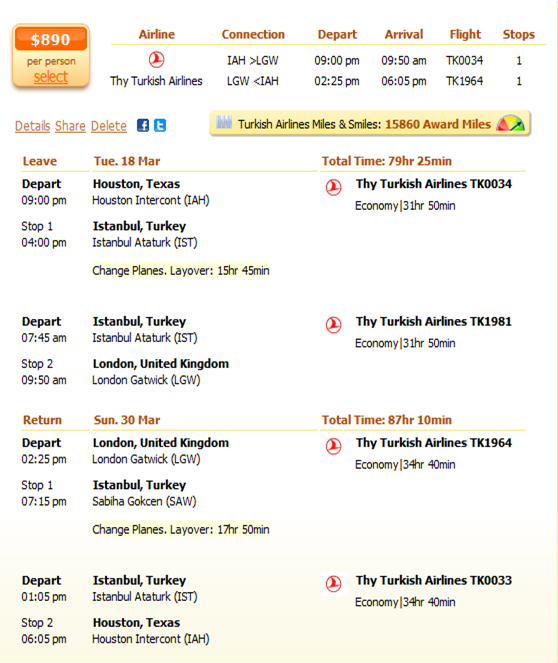 The next cheapest flight from Houston to London is operated by Lufthansa, starting from $903 r/t. The total flight time is 9 hours 25 minutes. The return flight has two stops, one at Dusseldorf, with a pretty long layover of 16 hours 40 minutes and one at Chicago, with a layover of 6 hours 16 minutes. The total flight time is 36 hours 13 minutes. Check the top 4 cheapest Houston to London flights in the table below.